With the two most recent signings out of Sweden, Calle Rosen and Andreas Borgman, the Toronto Maple Leafs now have a total of six defensemen competing for a single spot in the starting lineup. This total could be increased to seven if Matt Hunwick returns in the 2017-18 season. Being that Mike Babcock only plays left-handed defensemen on the left side and right-handed defensemen on the right, there will be stiff competition on the left. Since Morgan Rielly and Jake Gardiner already take up the first two left-handed positions in the top-6, the only vacant spot is the left side of the bottom-pairing. Competing for this roster position, we have Travis Dermott, Andrew Nielsen, Rinat Valiev, Martin Marincin, Rosen and Borgman. In Dermott’s first AHL season, he put up very respectable numbers. In 59 regular-season games, he had five goals, 19 assists for a total of 24 points. The playoffs were a different story offensively, as Dermott stepped up with 5 points in 11 games. He isn’t known for putting up stellar offensive numbers, but rather a solid two-way game. Dermott’s season was noticed by many, but some thought he was one of the best prospects among AHL defensemen. Dubas calls Dermott one of the best prospects on defence in the AHL. Felt he improved considerably this year. With these steady improvements, Dermott has the potential to crack the Leafs’ opening night roster on the bottom-pairing. 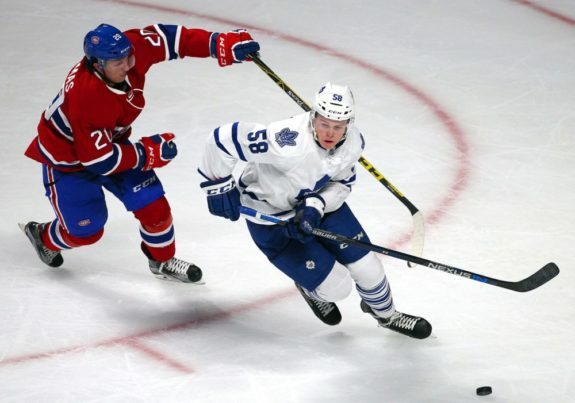 The question is if another year with the Toronto Marlies would be better for his development. Dermott will eventually be a regular in the Leafs’ lineup, but for now, it’s a tough decision. Of all the defensemen in the Leafs’ system, Dermott seems the most destined for a jump to the NHL club, as he provides a very steady presence on the blue line which could be of immediate help to the third-pairing. If Hunwick doesn’t re-sign, Dermott is the best player to take his spot. Even if he does re-sign, I could see Dermott forcing his way into the lineup. 2017-18 Projection: Leafs’ third pairing. Andrew Nielsen has been a consistent producer at both the WHL and AHL levels. 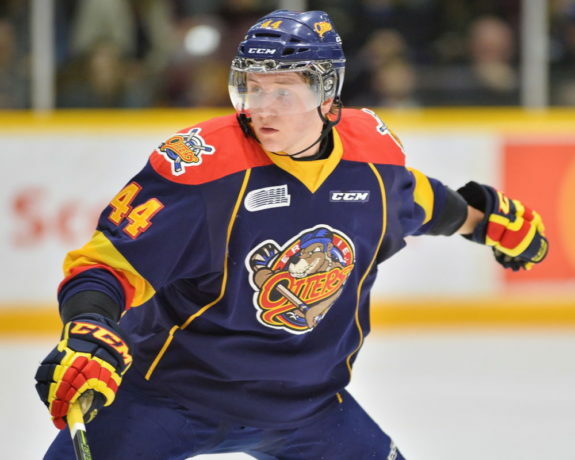 He was drafted in the third round of the 2013 NHL Entry Draft, with a respectable 24 points in 59 games. The following season, however, Nielsen catapulted himself amongst the WHL’s elite offensive defensemen, netting 70 points in 71 games, which is extremely impressive for defensemen. Some players can have trouble adjusting to hockey at the professional level, but not Nielsen. In his AHL rookie season, he scored 14 goals, added 25 assists for a total of 39 points. Clearly, he does not lack offensive instincts at any level. Where Nielsen could use some work is his skating. He is known as a slower defenseman who has well above-average offensive instincts and plays with a mean streak at times. 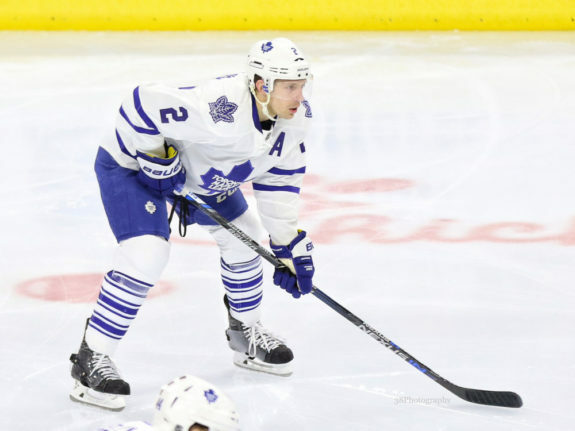 His physicality would be a nice addition to the Leafs’ blue line, but maybe another year in the AHL would be best to work on his skating and defensive ability. 2017-18 Projection: Marlies top defenseman, probable call-up. Marincin seems to catch a lot of hate from Leafs fans, but I guess that’s just how the game goes. He has had a tough time staying in the Leafs’ lineup but gets playing time in certain stretches of the season. He is not offensive, but rather has an elite stickhandling ability that is great at poke-checking, restricting the opposition’s entry into the zone, and keeping the blue line in the opponent’s end. This elite stickhandling is the basis of Marincin’s defensive game, as he isn’t very physical despite having a large frame. So in certain situations, he provides a decent option to fill in if need be. However, he is prone to making defensive mistakes, in which case his limitations make for a better option as a 7th defenseman. That is, only if he isn’t taken by Las Vegas in the Expansion Draft. 2017-18 Projection: Leafs’ 7th defenseman. Former NHL winger Ville Leino had some very high praise for this particular Swedish defender. He went as far as saying Calle Rosen was the best skater he has ever played with, then compared his skating and movement on the ice to Nicklas Lidstrom. That may seem like a crazy comparison, but Leino played with Rosen, I think he would know. Rosen had a very impressive season leading up to the Leafs contract, scoring six goals, adding 13 assists for a total of 19 points. NHL analysts see Rosen as an explosive skater with a very impressive one-timer. The 23-year-old is the second oldest player on this list, but will still need time to adjust to the North American ice surface. Expect him to begin the year with the Marlies’, then possibly earn time with the Leafs if he impresses and the opportunity presents itself. 2017-18 Projection: Marlies, possible call-up. The SHL Rookie of the Year, Borgman has potential to be one of the best free agent signings of the year. He put up 15 points in his SHL rookie season, then added 10 more in 14 playoff games. That may sound like some high praise for the Swede, but his hardware puts him with some very impressive company. Leafs sign Sweden's Rookie of the Year, Andreas Borgman. Previous D-man winners? Ekholm. Hedman. Enstrom. Kenny Jonsson. That is some very impressive company indeed. Considering they didn’t have to give up a single asset to acquire this player, it was quite the signing. I’m not saying he will be the next Victor Hedman, but there’s a good chance he will turn out to be an eventual regular in the Leafs’ lineup. I don’t believe that will happen next season, as he will need some time to adjust to the North American game. However, winning SHL’s Rookie of the Year is making hockey analysts wonder. If Borgman can get anywhere close to the names listed above, he was an absolute steal by the Maple Leafs. Rinat Valiev has witnessed his decline in the Leafs’ defensive depth chart with the sudden injection of talent. With the emergence of Nielsen and Dermott and the signings of Rosen and Borgman, his chances to be a regular with the Leafs are slim to none. Regardless, he is still competing for the position and has the second most NHL experience on this list behind Marincin. Valiev played 10 games with the Leafs in the 2015-16 season, where he was held pointless. On the bright side, he didn’t look bad in his NHL stint but didn’t receive any more time with the Leafs last season. 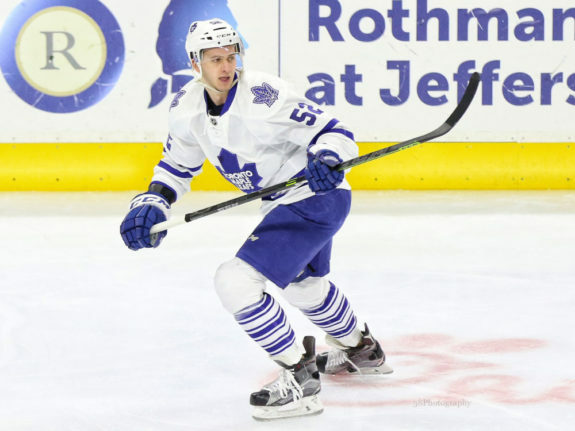 Instead, he endured a 47 game season with the Marlies’, scoring a total of 13 points. If he has a strong enough training camp, he could be a call-up if injuries occur. However, with positional competition heating up on the left side, he may not be the first pick to be promoted anymore. This whole article was written with the intention of Hunwick not returning to the Leafs for the 2017-18 season. If he re-signs, then he could very well take the third pairing position on the left side, or he could lose the job to Dermott and become an extra defenseman. It’s a tough call, and ultimately if he does re-sign, he should know that no roster spot is guaranteed, and there is plenty of internal competition brewing for those final roster positions. It will be an interesting training camp with regards to the Maple Leafs’ blue line in September, may the best defenseman win.